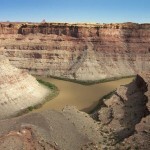 The Route – Across Utah! The Across Utah Route is not real. It’s not real in the sense that it is not an established route like the John Muir Trail or the Appalachian Trail. Instead, it’s just a personal passion of mine. 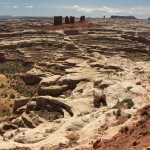 As a young kid I became fascinated with southern Utah. Its geology, history, and sense of wilderness captured my imagination. After many shorter hiking/backing trips, I was inspired by the Hayduke Trail Guidebook in 2006 to up the ante and hike across the entire state connecting some of my favorite spots! The same year that book was published, I hiked roughly from Kanab to Hanksville in 25 days. 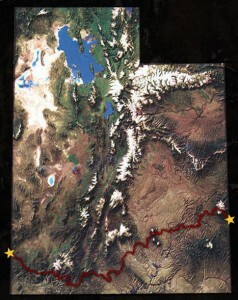 Then, a few years later, I did the whole thing — the 725-mile solo trek which spanned all of southern Utah in 49 days. You can read about it in the 2009 Trip Report. Since then I have returned several times for additional long hikes all the while gathering information to refine the proposed route and other alternates so that it can be a “Choose-your-own-Adventure” experience. I hope to do the entire trek again someday, but until then what follows is a guide for any others who want to make the trek across all or even a portion of this unofficial adventure route. NOTE — my proposed route is NOT for everyone. No part of the trail is technical, but many segments require excellent route-finding skills, climbing over boulders, walking ledges with exposure, fighting through brush, keeping an eye out for snakes and scorpions, crossing deep pools and/or strong currents and hiking long distances without water or contact with others. If this doesn’t sound like fun — don’t try it! The route stretches across the southern part of the state and travels almost entirely through public lands including four National Parks, two national forests, a National Monument and a National Recreation Area. I devised the route by linking official trails, documented wilderness routes, 4×4 tracks, old mining roads and some pure cross-country stretches found by trial and error. My goal was to find the most enjoyable “backcountry adventure” experience while balancing many different factors: scenic beauty, solitude, safety, water availability and access at key points for re-supplies and permit pick-ups. Leaving the Nevada/Utah state line, the route travels into Dixie National Forest as it winds its way up through the Pine Valley Mountains. Snow levels here may dictate which of several alternatives will work best, but all variants should produce great views stretching far to the east and into Zion. 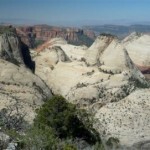 The second section of the journey takes hikers through much of Zion National Park. After leaving the Kolob Canyons, the route traverses to the beautiful West Rim. From here one descends to Zion Canyon and then immediately climbs back up to the East Rim before heading to the southern part of the park and the Barracks. The route follows this scenic canyon to Hwy 89 to the east. From Hwy 89 just south of Mt. Carmel Jct., the route heads east past Red Canyon and its short slot, around the White Cliffs and then up Kanab Creek. Eventually the route leads into Dixie National Forest and then follows the Grandview Trail through the pines and all the way to Bryce Canyon National Park near Rainbow Point. After winding through the southern part of Bryce Canyon, the route heads southeast into Grand Staircase Escalante National Monument. Here one travels through narrow, colorful canyons down to the Paria River and perennial water source and multiple archaeological sites. Leaving the Paria one goes cross-country to Hackberry Canyon and then heads upstream through another great slot canyon and to impressive Grosvenor Arch. The next section crosses the desolate and dry Kaiparowits Plateau. You are not likely to see many others along this stretch. 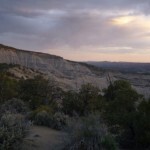 The suggested route heads north to the town of Escalante making a re-supply easy, but a southern alternate offers a glimpse into even more desolate canyons on the plateau before linking to Harris and Choprock Canyons bypassing Escalante and connecting to the Henry Mountains segment. After a likely re-supply in Escalante, the route continues down the Escalante River before heading up the swift waters of Boulder Creek. An incredible cross-country section takes one high above the canyons along slickrock before continuing up the Upper Gulch where one is likely to see a lot of petrified wood. After a short stint on a backroad, one goes cross country to enter Upper Muley Twist Canyon in Capitol Reef National Park. A short trip through the narrow canyon leads one to the Rim Route to actually walk along the Waterpocket Fold before continuing back down into the canyon, past several arches and to the switchbacks of the Burr Trail. 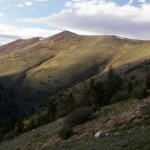 Here one follows the route of the Hayduke Trail up Tarantula Mesa and over the Henry Mountains. Variations are available based on the current snow level. A short side-trip to the top of Mount Ellen or another summit will reward with incredible views in every direction. Keep an eye out for the last remaining free-range bison herd in America. 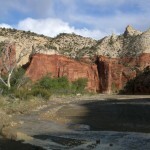 Crossing Highway 95, the route follows Poison Spring Canyon to a desolate section of the Dirty Devil River before crossing and ascending the photogenic Happy Canyon slot. The route continues through this unspoiled canyon system and into Canyonlands National Park near the Hans Flat Ranger Station. The route then descends the Orange Cliffs, skirts Horse Canyon and then takes the plunge into The Maze — an adventure with a big pack. 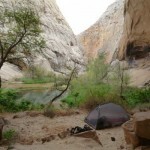 The route emerges in the Land of the Standing Rocks and then heads down to the Colorado River. Here one will need a packraft or borrow a ride across at the popular camp spot for those floating the river. 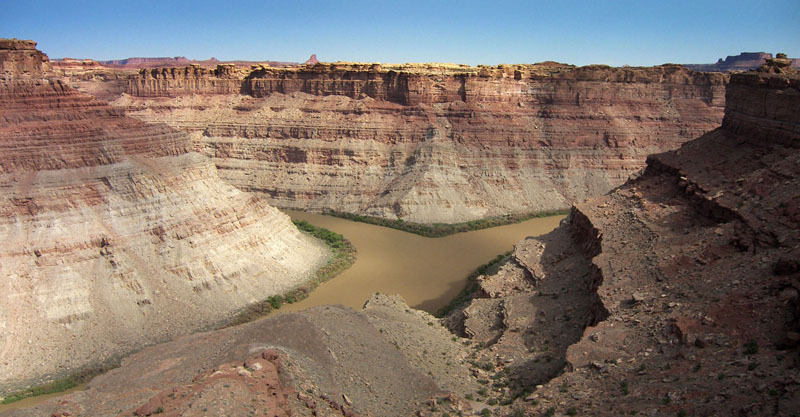 Once across the mighty Colorado the route follows the river up to the confluence with Green River before climbing the tall cliffs on the east side. 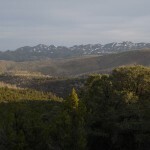 From here the route travels out the eastern side of the park and into the Indian Creek Wilderness area. One again the route follows the Hayduke Trail for a ways before climbing up and over Hatch Mesa and into Kane Springs Canyon which leads one up to Behind the Rocks region just west of Moab. The final section climbs up and over the highest peaks in southern Utah — the La Sal Mountains. The route for this final section should offer a welcome relief from the hot temperatures below if hiking in summer. 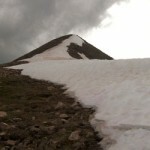 If conditions allow, one may opt to summit several of the highest peaks before beginning the descent down the eastern slopes and to the Utah/Colorado state line — finally Across Utah in approximately 700 miles! This is incredible. Would you ever consider being a guide. My boyfriend and I have been wanting to hike connecting Utah’s national parks. Thanks, Angela. I’ve usually have a pretty full slate just doing my own projects, but feel free to write me via my email address above and I’m happy to chat and help you guys out any way I can. Jamal, Thanks again for having a master map so I can follow your adventures.I see from the comment above I must have missed your trip on the JMT. I best go locate it immediately! 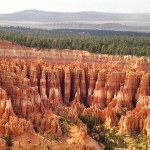 Loved your video on the John Muir trail, and look forward to watching the video on your trek in Utah.